Gold and silver futures traded lower on Monday for a second session in a row. The loss for gold was its fifth in sixth sessions. 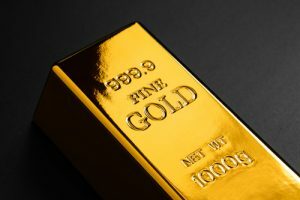 Gold for June delivery declined $2.50, or 0.2%, to settle at $1,318.20 an ounce on the Comex division of the New York Mercantile Exchange. Gold futures traded from a low of $1,314 to a high of $1,322.4. They rose 0.5% last week for their first weekly gain in four weeks. On Thursday, they settled at $1,322.30 an ounce for their best price since April 27. Elsewhere, silver for July delivery gave back 10.7 cents, or 0.5%, to finish at $16.645 an ounce. Silver futures ranged from $16.55 to $16.76. They climbed 1.4% last week after rising 0.7% last week. July platinum fell $11, or 1.2%, to $914.90 an ounce, trading between $911.10 and $928.80. Palladium for June delivery added $10.50, or 1.1%, to $995.70 an ounce, ranging from $983.40 to $997.40. Last week, platinum surged 1.7% and palladium jumped 2.7%. Last week, LBMA metal prices posted gains of 1.1% for gold, 2.1% for silver, 2.8% for platinum and 4.3% for palladium. United States Mint bullion sales registered gains of 6,200 ounces in American Platinum Eagles, 500 ounces in American Gold Eagles, and 100,000 ounces in American Silver Eagles.